What the blurb says: “A vicious robbery at a secluded Brighton mansion leaves its elderly occupant dying. Millions of pounds’ worth of valuables have been stolen. But as Detective Superintendent Roy Grace, heading the enquiry, rapidly learns, there is one priceless item of sentimental value that her powerful family cherish above all else. And they are fully prepared to take the law into their own hands, and will do anything – absolutely anything – to get it back. The ninth novel in Peter James’ award-winning Roy Grace series finds Detective Superintendent Grace juggling his job with the challenges of being a new parent. Sleep deprived and wishing that he could spend more time at home with Cleo and their baby son, Noah, instead Grace finds himself heading up the investigation into the robbery and violent assault of an elderly widow. This story has all the hallmarks of a classic Peter James novel – tight plotting, lots of twists and turns, great attention to detail. It also combines the present-day crime with a past mystery which begins in Brooklyn, 1922, when a young boy witnesses the murder of his mother and the abduction of his father. As Grace and his team investigate the present day crime, the two stories begin to intertwine through factors common to both – Gavin Daly, an elderly multi-millionaire with an unfulfilled promise, and a stolen broken pocketwatch. As Grace pieces the evidence together it becomes clear that his team are not the only people hunting for the killer. With several leads eliminated, he follows the trail of stolen goods first to Spain and then to New York. The only problem is, his dedication to the case may well have blinded him to a threat much closer to home. The theme of family is strong in this book. 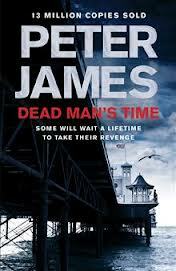 Peter James artfully interweaves the past and present crime stories, making the powerful and, at times ruthless, Gavin Daly a compelling and empathetic character. It’s also a fascinating glimpse into the world of New York gangs in the 1920s and the darker side of the UK antiques trade. With fast-paced action, great characters and a pair of intriguing and emotive crimes to solve, Dead Man’s Time is a real page-turner.